Newly remodeled lobby at Urology Group of New Mexico. Urology Group of New Mexico ‘s facility is conveniently located in the largest population area of Albuquerque. Montgomery Blvd. is a major east/west artery. The office is fifteen (15) minutes from the Albuquerque International Airport. The office is on the first floor with handicap access and adequate parking. 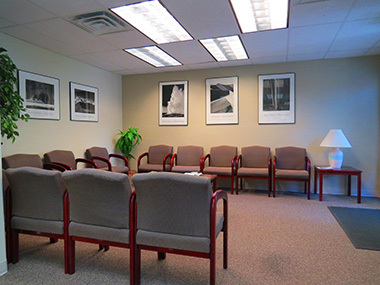 The patient waiting room has comfortable seating for eleven (11) at one time. Since this is a solo practice, there is more than adequate seating for patients and research subjects at the same time. UGNM provides a full range of urologic and uro-oncology services, including endoscopy, full urodynamics capabilities, and ultrasound. There is a total of four (4) patient exam rooms, an EKG room, an ultrasound room, and two (2) procedure rooms. The EKG room is the primary room for patient consent, but any of the others may be used. Laboratory work is generally sent to a local lab that provides daily pickup via courier. However, UGNM has a centrifuge for spinning urine. Drug storage is in locked cabinets with controlled access. We have a freezer capable of maintaining -40 degrees Fahrenheit. Patients have access to three (3) bathrooms for specimen collection. Scheduling for both medical and research patients is controlled using computerized scheduling templates. This maximizes efficiency and minimizes waiting times.